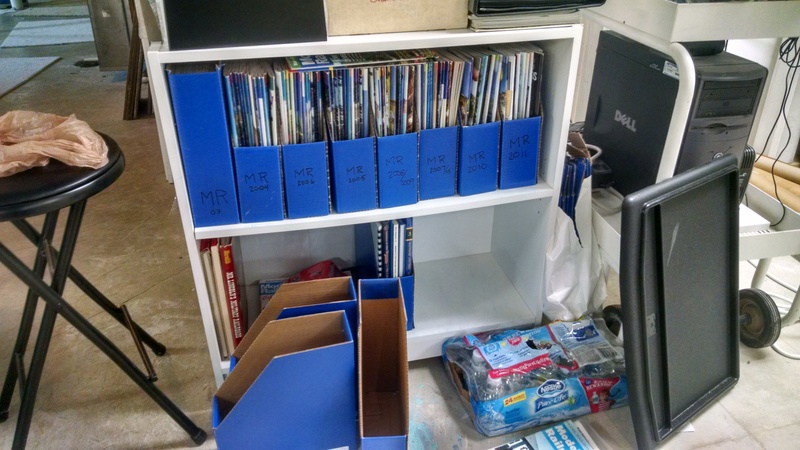 I love reading and collect model railroad magazines. Its hard for me to pass one up. I’ve tried to kick the habit but I can’t do it. So what is the problem you say? I’m out of space. Something has to give. Especially if I’m going to have a model railroad. My decision – Cut them up! Keep the articles I want and put the rest in the recycle bin. What to keep? Anything two-foot of course, but much more. I like like lots of modeling, prototypes, scales, gauges…I will model other stuff than SR&RL. Yes I will….so the more includes quality drawings, model building articles, painting, scenery,industries…..track plans,lots of them, operations articles, …. In the photo above is the station where I slice and dice. Tools are a sharp knife, straight edge, cutting pad and stapler. On left is box of mags waiting surgery. A stack of cut up mags is at top. Right of the pad are the most recently extracted articles. The full stack of extractions (MR 1970-1990’s) is the stack at upper right. What was 3 shelves (7-8 linear feet) has been reduced to a 9″ stack. The hardest part is having to choose between two desired articles that share a common page. In the end I free my mind with “there is no wrong choice. You’ve not read these articles in years and likely will never need either…”. With that I pick and move on. I’m now cutting up MR’s in the 2000’s. I’m considering if I should cut all the way to present or let the most recent years remain whole. After MR’s will be NMRA & RMC. Some specialty mags and annuals will likely remain whole. Next time organizing, storing, and use. 2 Responses to Thinning the herd! I used to do this, and then the binders full of articles got too big. So now I cut out the pages and scan them. 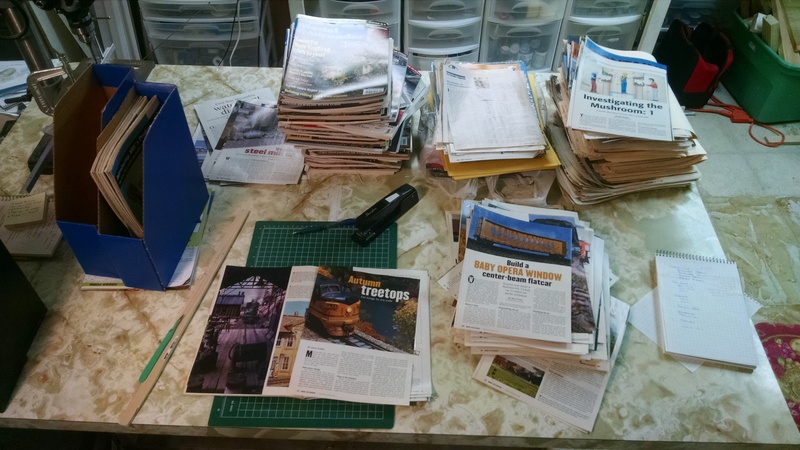 Using a full-duplex scanner makes quick work of the pages once they’re cut out. I save each issue separately, then if I can ever find an index again, I have a hope of finding the right PDF. Having said that, the times when they are useful are really far and few between. What we really need in each city is a library that contains all the back issues from the local community of modellers. The other thing I do is I pass any issues that are largely intact along to a youngster that I know who is interested in trains (my own kids are not as keen as this guy). For example, my mother was getting me for Christmas for years, but most issues contain no more than one article that is worth scanning. My ten-year-old buddy gets all of those, which are a perfect level for him anyway. Finally, if you do this, you must decide never ever to look at the value of specific issues on ebay. I once cut up issue 1 of Mainline Modeler (it had some excellent material in it), and later saw it at a silent auction with bids in the $80 range. I think I even bought my copy used for 25 cents! For me, electronic copy is not the same. I get informed of Model Railroad Hobbyist (MRH), but rarely read it. I now get OpSig’s Dispatcher’s Office electronically too, but again consumption of content has gone down. Like you, I work computers all day, but I prefer to get away from the screen when I can. I know I may never return to some articles. I’m hopeful that the process of storing new articles will cause me to skim the old and thus refresh my brain cells. Mainline Modeler….That had great content. But I will say, that I’m surprised by the quality of the content in my old MR’s. In the 70’s and 80’s there was a detailed drawing or two in just about every issue. Boxcars, Steam locomotives, etc… Lots of great stuff! Still some good drawings going in the contemporary issues too. Your process is working for you and time will tell if my process works for me….For now, I’m achieving my main goal of purging and better yet, I’m enjoying my process!